Get yourself a notebook and write down how much your pet weighs. Then write down how much your plump pooch should ideally weigh. If you need help with the numbers, consult your vet. The discrepancy between reality and your goals will determine how drastic your changes will have to be. You’ll need to weigh your dog each week so you know exactly how well your efforts are working. Write the dates and the results down in your notebook. You can get an accurate weight on most dogs by simply weighing yourself, then weighing yourself holding the dog and calculating the difference. A very small dog will need to be weighed on a kitchen scale because every ounce counts. If your dog is too big to lift, ask to use the scale at your vet’s office. An overweight dog is probably eating too much. Do you feed your dog a specific amount of food each day, or do you leave a full bowl out for the dog to eat any time? 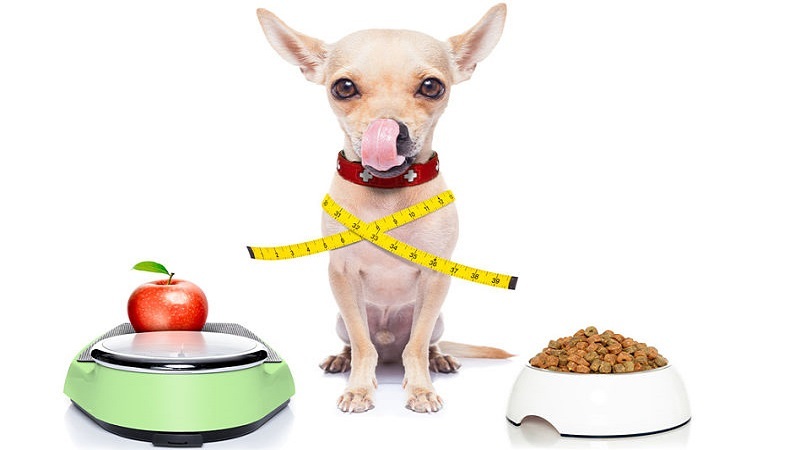 In order to lose weight, your dog should be consistently eating the same amount of food each day. Commercial dog foods have recommendations on the bag, but you can also ask your vet how much to feed your dog. Give your dog a set amount of food, and do not deviate from that. If the dog begins to lose weight, you are on the right track. If you make no progress for a week or two, decrease the amount. You can feed your dog once each day or divide the amount into two or three portions if you feel like your dog is getting hungry between meals. Usually cutting back on regular food will do the trick, but you can also consider feeding your dog a food specifically made for weight loss. These dog foods have fewer calories and often allow you to feed your dog more. Choose a food that is low in carbs and high in protein. This gives your best friend plenty of great energy. Treats are a part of any appropriately spoiled dog’s lifestyle and being on a diet doesn’t have to mean that the treats have to stop. Dogs don’t know the difference between large and small treats. They just know they’re being given something good. Your dog will be just as happy with small treats as with large ones. You can also break your regular treats in half or even quarters. As far as dog weight loss is concerned, one of the quickest and most effective steps you can take is to simply stop sharing your own food with your dog. Yes, dogs love people food. Yes, it’s very hard to resist those big brown eyes and sweet face. But you are going to have to remind yourself that feeding your dog table scraps is not the most loving thing you can do. Don’t feed your dog from the table. Don’t share your snacks with your dog. It may seem mean in the moment, but it’s really the right way to keep your dog healthy and happy for as long as possible. While you should not be sharing your food with your dog, you can give your dog delicious vegetables. Offer your dog green beans, carrots, cucumbers or celery as a snack during the day. It will keep your dog’s tummy full without all the calories. Dogs can also have pears, pineapple and blueberries. Avoid feeding your dog onions, grapes, tomatoes and cherries. All of these foods contain substances that are toxic to dogs. When in doubt, ask a vet. One very important key to helping your dog get slim and trim is encouraging exercise. Dogs need to run and play in order to stay healthy and happy. Take your dog for long walks each day, and spend time playing with a ball or other toy. If your dog loves to play fetch, head out to a large dog park and play until you are both exhausted. The exercise is healthy for your dog and for you, and playing together is bonding time. You don’t have to worry if your dog has a weight problem. When it comes to dog weight loss, there are plenty of steps you can take to help your dog shed the pounds and stay active and strong. When you keep your pet at the right weight, you are giving yourself the best chance at having a happy and healthy dog for many years to come.